What is an Anterior Cruciate Ligament? structures of the knee and control the back and forth motion of your knee. The ACL is one of the four major ligaments of the knee. It is an important stabilizing mechanism for the knee, and allows rotational movements such as turning, twisting and sidestepping. 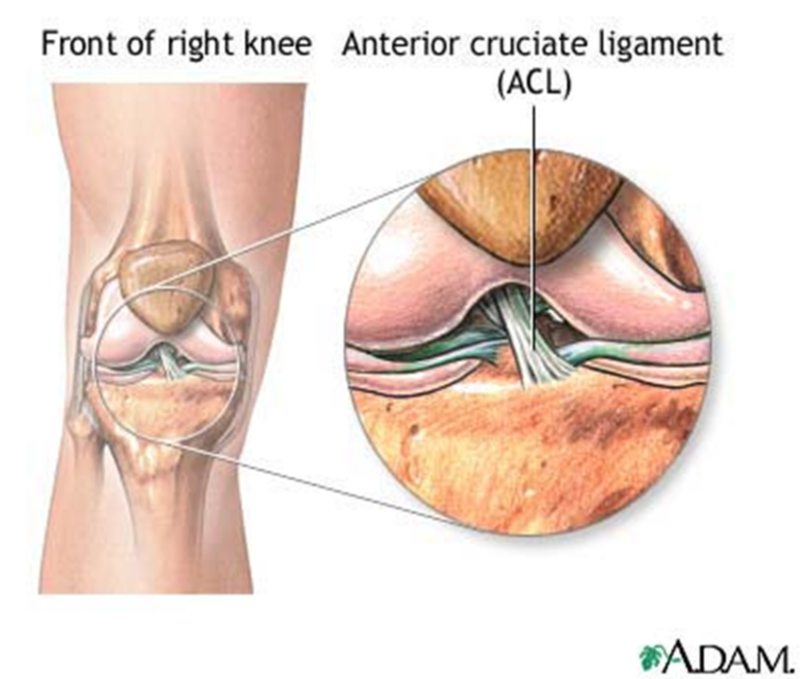 What causes an anterior cruciate ligament tear? An ACL tear or rupture is most often a sports-related injury, but they can also occur during rough play, motor vehicle collisions, falls, and work-related injuries. Most often ACL tears occur when changing direction rapidly, stopping suddenly or landing from a jump. Several studies have shown that female athletes have a higher incidence of ACL injury than male athletes in certain sports. It is believed that this is due to differences in physical conditioning, muscular strength, and neuromuscular control. Other suggested causes include differences in pelvis and lower extremity (leg) alignment, increased looseness in ligaments, and the effects of oestrogen on ligament properties. About half of all injuries to the anterior cruciate ligament occur along with damage to other structures in the knee, such as articular cartilage, meniscus, or other ligaments. 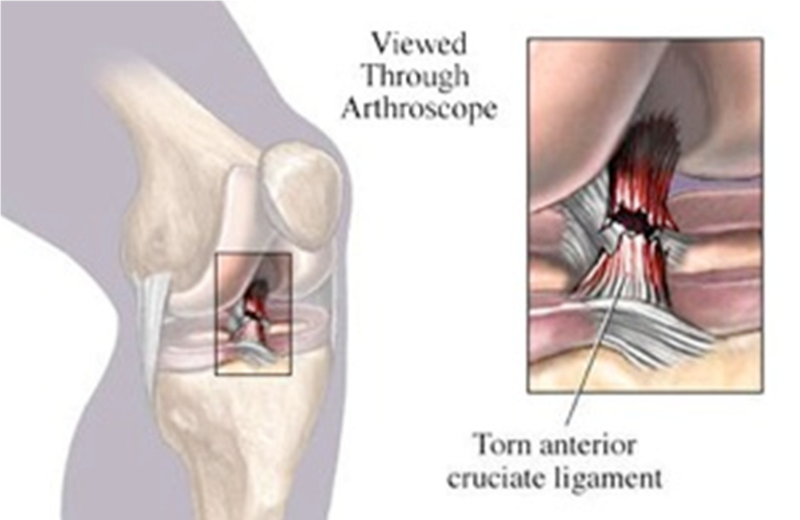 Unfortunately the ACL cannot repair itself and the knee often becomes unstable or gives way. Long term this may lead to arthritis or acute meniscal tears. 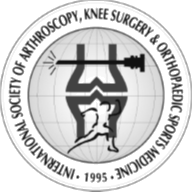 Your surgeon will take a full medical history and conduct a physical examination to confirm a tear or rupture of the ACL. During the examination, your doctor will check all the structures of your injured knee, and compare them to your non-injured knee. Most ligament injuries can be diagnosed with a thorough physical examination of the knee. Sometimes an MRI will be necessary to show if any other ligaments and surrounding structures of the knee are damaged. It is quite common to damage the meniscus and other ligaments at the same time as the ACL. An X- ray may also be arranged if any fractures are suspected. What is the surgical treatment option? Surgery will usually be considered after an initial 4 to 6 week period, which allows the inflammation and pain from the injury to settle. Most ACL tears cannot be sutured (stitched) back together and therefore the ligament must be reconstructed by using another tendon or ligament as a substitute. Your doctor will replace your torn ligament with a tissue graft which can be obtained from several sources. They may be harvested from the patellar tendon, which runs between the kneecap and the shinbone, or the hamstring tendons at the back of the thigh. On occasions a quadriceps tendon may be used. Another option available is using a cadaver graft (allograft). There are advantages and disadvantages to all graft sources. You should discuss graft choices with your own orthopaedic surgeon to help determine which is best for you. In general, this surgery is very successful and while it does not give you a normal knee, it does stop the knee from repetitively dislocating and makes it feel stable.